The Refined Geek » Bigelow Aerospace Brings NASA’s Technology Full Circle. Bigelow Aerospace Brings NASA’s Technology Full Circle. If you wander over to the Space section of this blog you won’t have to look far to figure out which company I have a huge man crush on. Whilst SpaceX might be the toast of the private space flight industry thanks to their incredibly impressive achievements and lofty goals they’re far from the only player in the game and they’re really only currently focused on getting cargo and people into orbit, keeping them there is still someone else’s job. This isn’t to say that no one is working on solving that particular problem however and Bigelow Aerospace, a company I’ve mentioned in passing a couple times, is one such company. Bigelow Aerospace is the brain child of Robert Bigelow funded primarily from the fortune he made from his ownership stake in the Budget Suites of America hotel chain. Unlike most private space companies which are primarily focusing on the launch side of the equation Bigelow is instead focusing solely on the staying up there part, developing technology for a new kind of space station that promises to deliver much larger usable volumes at a fraction of the cost of traditional space station modules. They’re in fact so far along the development path that they already have 2 of their modules Genesis I and Genesis II in orbit right now and they’ve been there for the better part of 6 and 5 years respectively. Their modules are based off of a pretty novel idea that NASA was developing back in the early 1990s. Dubbed TransHab the idea was to be able to build modules that were of a certain size when launched but could then be inflated once in orbit to provide much more room. Additionally the inflatable design means that it’s much more resistant to micrometeorite impacts as the outer surface will flex, reducing risks to the crew and lowering ongoing maintenance costs. Unfortunately due to the budget overruns of the International Space Station project the TransHab was ultimately cancelled but Bigelow licensed the technology from NASA and set about creating his own versions of them. 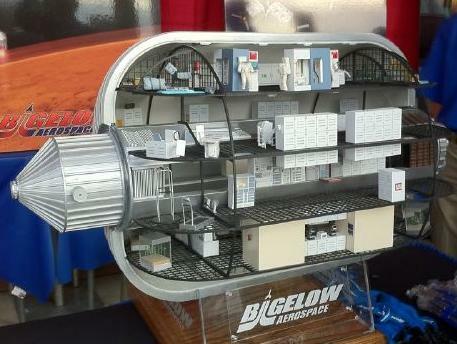 The goal for Bigelow was to start up his own private space stations in orbit, essentially extending his hotel chain to outer space. Whilst they’ve had functional verification of their systems for a long time now their biggest issue was a lack of transportation methods in order to get people up there. Seats on Soyuz craft are now going for upwards of $50 million dollars and Bigelow’s plans just aren’t feasible at that price point. Indeed the current lack of usable alternatives prompted Bigelow to slash its staffing by over half at the end of 2011 although they have begun rehiring now in preparation for the availability of such services coming online in 2016. What is pretty incredible though was the recent news that Bigelow has won a contract with NASA to provide an inflatable module for the International Space Station. Whilst there’s scant details about what the module will actually be (that’s apparently scheduled for a press conference today) it’s a safe bet that it’d be something like their planned BA-330 although it’s entirely possible that they might go for gold and debut their giant BA-2100 (pictured above) which would almost triple the current liveable volume of the ISS. It may seem counter-intuitive for NASA to buy their own technology back off a private manufacturer but Bigelow has invested some $180 million into getting the project this far, a sum that I’m sure no one at NASA wanted to spend when they already have so much invested in rigid modules. The amount of innovation we’re seeing in the private space industry is simply staggering as we’re fast approaching the point where the only thing that stands between you and your own private space station is the capital required. Sure that’s still no small barrier but the fact that we’re commoditizing space travel means that it’ll soon be something that will be within reach for all of us, much like the commercialization of air flight last century. NASA’s contract with Bigelow is proof that the nascent space company is at the point where it’s technology is ready for prime time and I can’t wait to see one of their modules up in space.